Among the most pressing of today's environmental issues is the pollution of air. Air is the breath of life, yet there are many kinds of air pollution contributing to problems that range from human health issues to climate change. 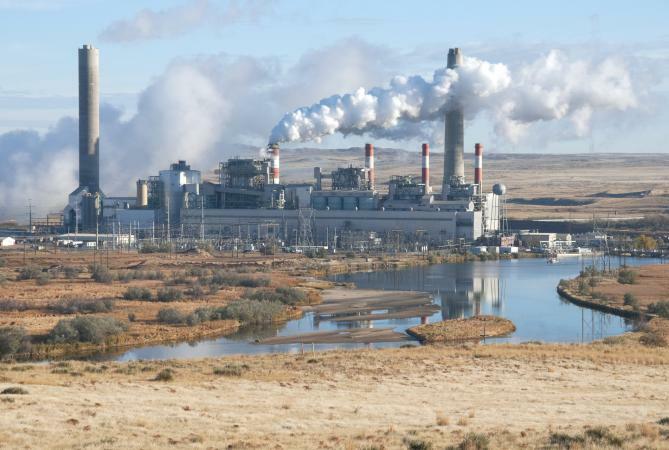 The Idaho Department of Environmental Quality states that the Clean Air Act of 1970 (CAA) identified ozone, particle matter, carbon monoxide, nitrogen gases, sulphur dioxide, and lead as six main air pollutants. The two forms of air pollution considered most harmful to humans by the American Lung Association are ozone or smog, and particle pollution or soot. Ozone is considered the most prevalent air pollutant by the American Lung Association. Ozone is not emitted, but formed through a chemical reaction between sunlight and gases like nitrogen oxides, carbon monoxide and volatile organic compounds (VOC) explains the US Environmental Protection Agency (EPA). These gases are emitted by the burning of carbon based or fossil fuels. This is called ground or tropospheric ozone and is 'bad', as opposed to the 'good ozone' found in the stratosphere that protects earth from harmful ultraviolet components of sun rays. Ozone pollution is generally highest during the sunniest months of the year, from May through October. Health issues: This pollutant can cause short-term health issues immediately following exposure, such as irritation to skin and the respiratory system, and long-term exposure can lead to more serious health problems, such as higher rates of pulmonary disease, and "worsen bronchitis, emphysema, and asthma" according to the EPA. Children, the elderly, asthma patients, and people who work outdoors are most at risk. Environmental impact: Ground level ozone can damage ecosystems and plant growth in forests, wildlife refuges. It can be very harmful for growing plants. Mother Nature Network (MNN) reports that, "In the United States alone, ozone is responsible for an estimated $500 million in reduced crop production each year." 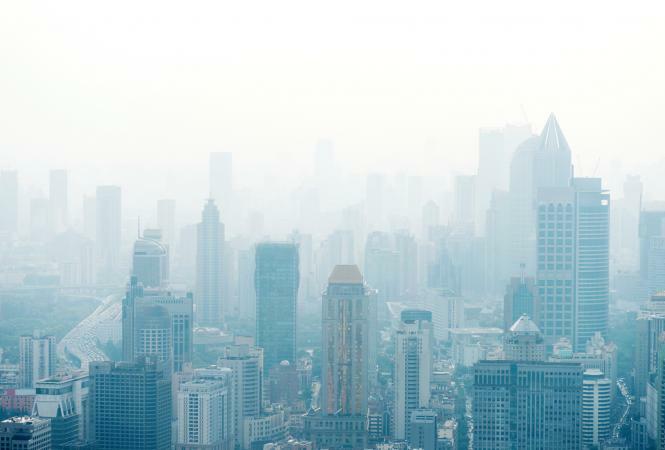 American Lung Association's State of the Air 2016 says particle pollution also takes a place at the top of the list of most dangerous pollutants to human health and is widespread throughout the environment. 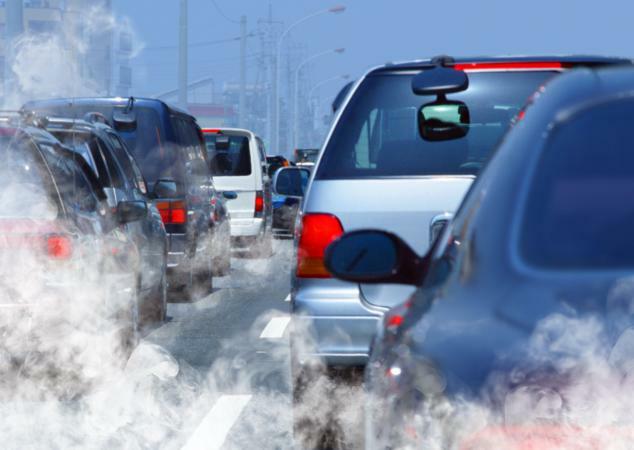 This air pollution is composed of solid and liquid particles made up of ash, metals, soot, diesel exhaust, and chemicals. Centers for Disease Control and Prevention (CDC) explains that particle matter (PM) is produced from two different kinds of sources - primary or secondary. "Primary sources cause particle pollution on their own," writes the CDC, who goes on to say, "For example, wood stoves and forest fires are primary sources." Secondary sources "let off gases that can form particles" and originate from power plants and coal fires. Factories, cars and trucks, and construction sites act as both primary and secondary sources. The World Health Organization Factsheet (WHO) lists the major matter in pollution as sulfate, nitrates, ammonia, sodium chloride, black carbon, mineral dust, and water. Particle pollution can be dangerous even in low concentrations, leading to increased mortality and morbidity, and is the pollutant that affects people more than any other pollution. The size of the particles formed are different and have differing effects, according to the WHO. The coarser particles have a diameter of 10 microns or less, (≤ PM10), and are more deleterious to health as they get into lungs and blood, and lodge there causing respiratory issues, cardiovascular diseases and lung cancer. ≤PM10 is produced by farms, construction sites, mines and roads reports CDC. The New York State Department of Health reports that the finer particles are 2.5 microns or less (≤ PM2.5). These get into the respiratory tract reaching the lungs and cause short-term problems such as irritation of eyes, nose, throat and lungs and shortness of breath, besides worsening existing asthma and heart diseases. In still weather, extreme pollution results in foggy conditions and reduced visibility. 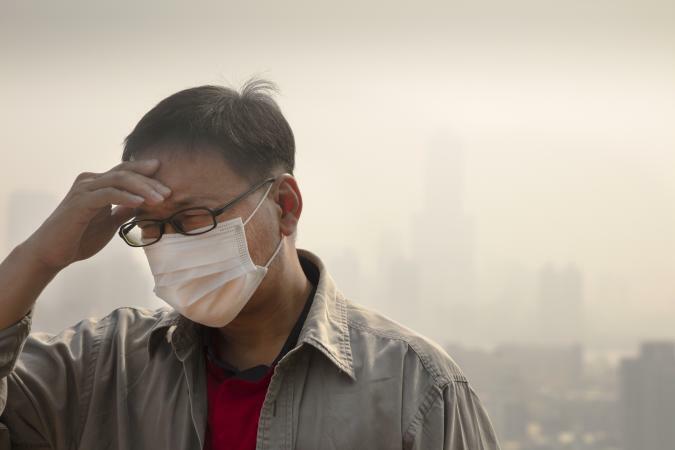 ≤ PM2.5 is produced by "power plants, industrial facilities, and cars and trucks," reports CDC. The important air pollutants which also pose health risks to humans are carbon monoxide, nitrogen oxides, sulfur dioxide, lead, dioxins, and benzene. Carbon monoxide is produced by the incomplete burning of fossil fuels in vehicles, home heating equipment, and industrial plants, among many other sources, and is a colorless and odorless gas, poisonous to humans and animals when inhaled, states CDC. It can cause poisoning, whose symptoms "are headache, dizziness, weakness, upset stomach, vomiting, chest pain, and confusion", and lead to death when inhaled by sleeping or drunk people. EPA's Clean Act Overview states that the entire U.S. meets carbon monoxide standards. Sulfur dioxide is produced by the burning of sulfur containing fuels like oil and coal, and can cause health issues, especially in those with existing heart or lung conditions. The WHO Factsheet states that when it mixes with water it produces sulfuric acid, that is present in acid rain, that has destroyed vast areas of forests. Encyclopedia.com states it affects tree growth and makes them prone to "winter injury, insect infestation, and droughts," and reduces survival of aquatic life. Nitrogen oxides are gases that contribute to smog and also produce acid rain and its associated effects. This pollutant is produced from "combustion processes" in land vehicles and ships related to power, heat, and running engines. combustion processes. The EPA Clean Act Overview reports that this gases also produces respiratory problems and are associated with increased emergency hospital visits. Nitrous oxide production could double by 2050 claims Carbon Brief. Lead is emitted into the air by vehicles and industrial sites and by waste burning facilities. Manufacture and recycling of lead-acid batteries, processing of metals, iron and steel, copper, glass, cement, and industrial and institutional boilers are other sources of lead, according to the Texas Commission on Environmental Quality. People can inhale lead directly or be affected by it when it settles on soil. It is a neurotoxin when present in the body in high concentrations, and causes immune issues, reproductive problems, kidney disease, and cardiovascular problems. Infants and young children are especially susceptible to having issues with lead exposure, according to WebMD. Dioxin is present in plastics, and is released during its manufacture and if plastic waste is incinerated, points out the National Institute of Environmental Health. Its emissions have been reduced by 90% since 1987 through strict rules. The WHO says it causes skin lesions, and affects the liver as well as immune, nervous, endocrine and reproductive systems. Benzene pollution occurs during some industrial processes and use of products containing petroleum, like plastics. Tobacco smoke exposure is another source. It can cause cancer and anemia according to the WHO (pg. 1). Perhaps the most publicized form of pollution today is the mixture of gases responsible for producing the greenhouse effect, leading to global warming and climate change. A certain percentage of greenhouse gases are produced by natural sources and collect in the atmosphere, forming a layer of reflective and absorbent materials that prevents some of the heat radiated by the sun from escaping the Earth's atmosphere. This keeps the temperature sufficiently warm for plant and animal life to thrive, explains Livescience. However, with the addition of man-made greenhouse gases, too much heat is reflected back into the atmosphere, giving rise to global warming. Beginning with the Industrial Revolution, man has added to that production of greenhouse gases, primarily by the burning of fossil fuels. Among the most common of these are carbon dioxide, methane, nitrous oxide and chlorofluorocarbons (CFCs) notes NASA, and the present climate change is mainly due to human activity. Burning of fossil fuels in vehicles, agricultural use, and energy production are the main causes. Clearing of forests, use of nitrous oxide in fertilizers, and gases used in refrigeration and industries are adding to this problem points out National Geographic. Melting of polar ice, raising ocean levels and flooding coastal and other low-lying land areas. Increase in extreme weather events such as storm activity, increased force and severity of hurricanes, cyclones, and tropical storms. Severely altered ecosystems and farming, and extinctions of plant and animal species. The Natural Resources Defense Council (NRDC) lists some pollutants that are biological and produced in nature, like pollen and mold. 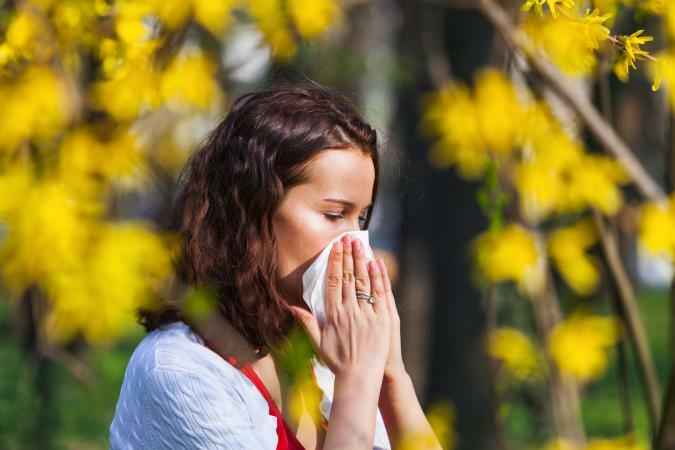 Pollen from trees, weeds and grass can cause allergies and hay fever, and is a health problem even if it is not lethal. Pollen pollution is expected to increase with global warming as growing seasons lengthen, according to the Vermont Department of Health. Mold is a problem affecting indoor air quality. Some molds produce toxins that bring on allergies and asthma. Molds occur in damp buildings or those with high humidity. Some local government resources, like the Southwest Ohio Air Quality Agency in Hamilton County, provide information on the daily levels of pollen and mold for many species of trees and plants. The U.S. air quality standards are specified by the EPA in their National Ambient Air Quality Standards Table (NAAQS). In addition, people can check the level of pollutants in their area at the website AirNow, maintained by the government. The State of the Air 2016 found that air quality had improved over the decades, with a 69% reduction in pollution since 1970, even though it was marked by growth in industries, energy use and mileage. Pollution levels have continued to fall from 2012 to 2014. However, 25 of the worst polluted cities reported more unhealthy days than before (pg. 4 & 5), so air pollution is still an issue. While the many kinds of air pollution that contaminate the air today are certainly of concern, awareness is growing about the danger they pose to people and the planet. New regulations put into place over the past several decades, such as the Clean Air Act and others, have significantly reduced the amounts of pollution pumped into the air every day. While there is much more to be done, environmentalists have managed to bring global warming and other environmental hazards to the forefront, gaining support from the public and the politically connected, advancing their cause in the halls of the United States government as well as in international forums.